About half an hour ago we sat down to pen a new music blog post, which will be coming soon, but before we get to that something popped up that distracted us from the matter at hand. Despite appearances, 1996 was a good year for Saint Etienne. Although it was two years since Tiger Bay came out and another two years before they would release Good Humor they weren’t resting on their laurels. I would regularly see them DJing at the Heavenly Jukebox at Turnmills, alongside the likes of The Chemical Brothers. It seems kind of crazy to think that you could go clubbing where the Chemical Brothers were residents, but remember that Dig Your Own Hole didn’t come until 1997. If it wasn’t the Chemical Brothers headlining the night, it would be David Holmes, or Richard Fearless from Death in Vegas, or Jon Carter from Monkey Mafia, or Andy Weatherall. Only in retrospect can I see just how stellar the line ups were. Saint Etienne have had one foot in the charts and the other on the dancefloor ever since Pete Wiggs and Bob Stanley decided to cover a Neil Young song because they hadn’t yet written any songs of their own. The 7″ version of Only Love Can Break Your Heart is a Balearic classic, but Andrew Weatherall’s Mix of Two Halves (a nod to the fact that Saint Etienne are named after the football team rather than the French town) was the first of dozens and dozens of remixes which were as good, if not better than the original. In 1995 the limited edition run of Saint Etienne’s first best of, Too Young To Die, came with a bonus disc of remixes which went down a storm. The following year this bonus disc got a full release with an extra cd. Casino Classics hit the shelves and featured remixes by The Chemical Brothers, Aphex Twin, Way Out West, Underworld, Monkey Mafia and Death in Vegas. Where the first disc was previously released mixes, the tracks on disc two were brand new unreleased remixes. Some were remixes of tracks that hadn’t even been released, and tucked at the end of the compilation was a remix by Broadcast, who at the time had only put out one EP and had yet to sign to Warp records. Over the past three years, Saint Etienne have slowly been reissuing remasters of all of their old albums, and it’s now Casino Classic’s turn. Where each previous reissue has included an extra disc of material, the deluxe reissue of Casino Classics comes with two discs of additional material covering some of the best remixes since the original release all the way through to the release of London Conversations – the remastered Greatest Hits which kicked off the reissues. On the new version we’ve gained remixes of tracks by the likes of Paul Van Dyk, Faze Action, Tiesto, Aim, Add N to X and Hybrid, as well as US-only remixes of Only Love Can Break Your Heart and Nothing Can Stop Us by Masters at Work. There’s also some more remixes from the older days which weren’t included on the original Casino Classics including Pete Heller’s piano house take on Kiss and Make Up which only ever came out on 12″ over twenty years ago. 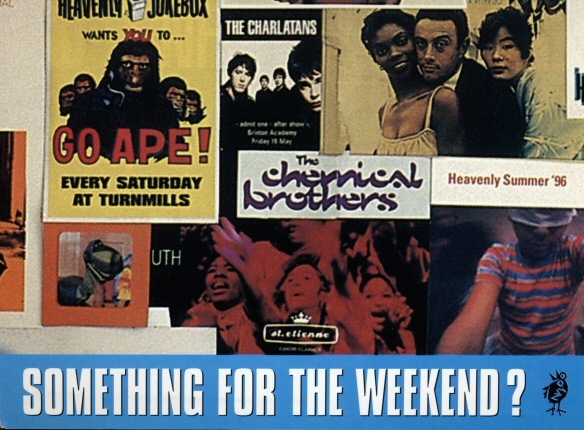 Completing the circle, things finish with their Cola boy remix of The Method of Modern Love – the last single from the period covered. Cola Boy was another project that Pete and Bob were involved with in the early days of Saint Etienne, who only released two singles in 1991. It’s hard to know where to start with recommending tracks from this compilation. I’ve already mentioned the Andrew Weatherall remix of Only Love Can Break Your Heart, and the Broadcast take on Angel. David Holmes remixed Like a Motorway before he got the funk, and is an amazing thirteen minute acid-techno wig out. The Monkey Mafia remix of Filthy is a big beat classic. The Faze Action mix of Sylvie is ten minutes of brilliant Latin house. Cool Kids of Death mixed by Underworld has been slimmed down by four minutes from the original to be able to fit more tracks in, but you still get more ten minutes of it. Their foray into drum’n’bass – when PFM remixed Down By The Sea is also reduced by half, but across the four cds (and the bonus downloads), you get a monster 54 tracks. It’s astonishing for any band to have that many remixes in the first place, let alone so many over so many years of such consistently high quality.